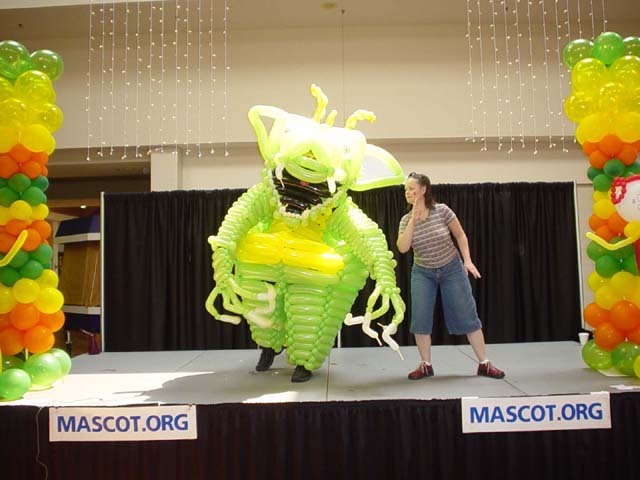 The act utilizes 300 twistable balloons to crate a lager-than-life mascot performance. 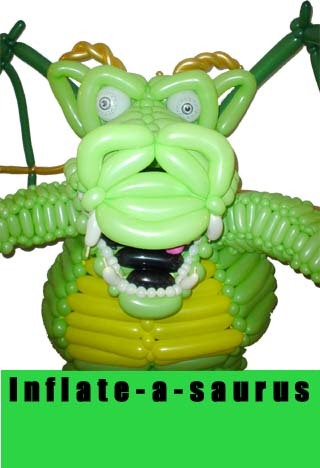 Inflate-a-Saurus stands over 6 feet tall and takes 21 man-hours to construct. The 1-week lifespan creates a 7-day long unique and fun experience for guests. The fabrication is similar to ice & sand sculptures. Four balloon artists start with nothing more than 6 bags of balloons and an air compressor. Five hours later the result is a completed Inflate-a-Saurus. As construction takes place, passing guests can observe the process of creation. They can listen as the balloon artists banter back and forth and use industry jargon to build the piece. Inflate-a-Saurus comes to life in a stage spectacle. This can be a great follow-up to the construction process or as an independent stand-alone show. 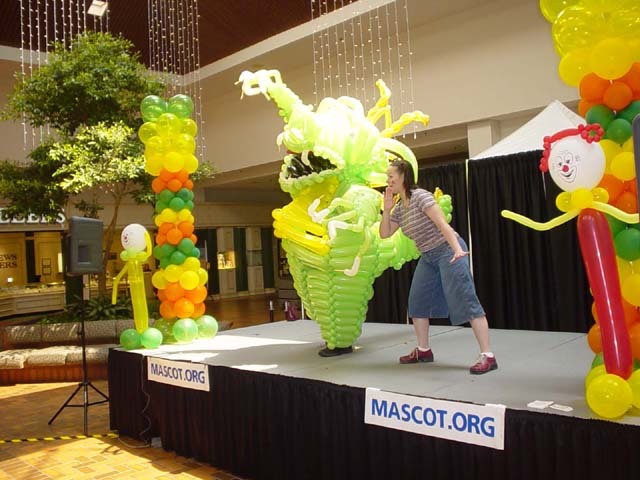 The show starts as the balloon mascot sits lifelessly on stage. The host uses the audience and some magic words to wake up Inflate-a-Saurus. Upon hearing the correct word or phrase he springs to life but is fearful at finding himself before a live audience. As the show host introduces Inflate-a-Saurus to our friends, he gradually warms up to them. The show proceeds with interactive audience games that encourage unity and promote diversity and friendship. 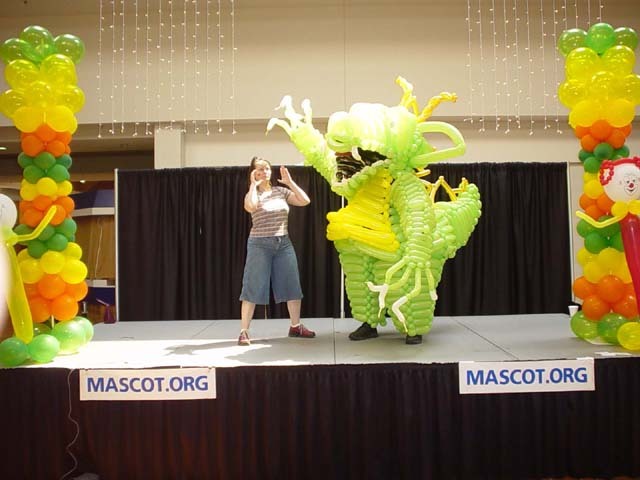 Using essentially the same show described above, we employ a more simplified balloon mascot costume that can be constructed in advance using fewer man-hours wile maintaining its unique qualities. This show is ideal for schools or budget-conscious community events. This is a great follow-up to a show or the construction of Inflate-a-Saurus. He comes to life to meet his friends, pose for pictures and offer a “balloony” hug. We may be able to offer this as a stand-alone if we have pre-built an Inflate-a-Saurus 7 days prior to your event. For leagle resons we are not allowed to publish pictures of kids interacting with the characters. You will have to take our word for it inflate-a-saurus is a hit!